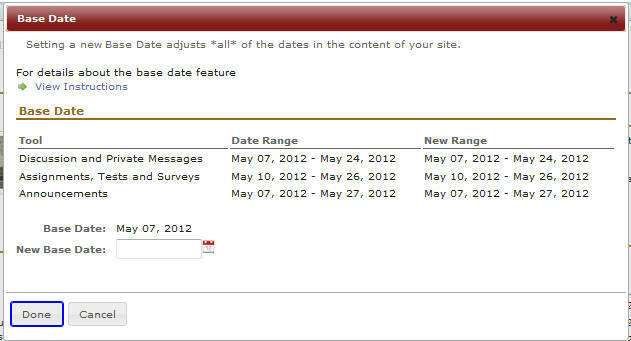 The "Base Date" feature allows you to adjust *all* of the dates in your sites for next term in ONE click! 1) In your New Site, click on Site Setup >> Import from Site. Complete the process. Once you've copied your content into your next term's site, you can use the Base Date to adjust the old dates. 2) While in Site Setup, click on the Edit button by 'Set Base Date'. 3) A window will open listing all the date ranges in each of your course site's tools that have dates. This information is provided to help you review the dates that you had established in a previous site, determine what the new base should be, and catch any inconsistencies in the date ranges, prior to setting the base date. Additionally, you will see your current base date and a field for you to set the "new" base date for the course. Tip! Before proceeding, write down your original "current" date under Base Date. This way, if you make a mistake, you can set the new base date back to the original and start all over. 4) Set the new base date and click on Done. Your new base date will be applied, and you can see your new date ranges. Etudes will update all of your dates forward or back in time proportionately (a few months, weeks, or days), based on the new base date that you set. The base date feature updates open, due, allow until dates, review on a specific date, and release dates in items that you have in: Schedule, Announcements, Modules, Assignments, Tests and Surveys, Discussions, Home Page items, and Manage Access (Publish / Unpublish site dates). The base date feature is a powerful feature, but it is NOT a 'magic' button. It will not made decisions on your due dates for holidays, spring breaks, etc. They vary across institutions, based on contacts and calendars. So, you will need to review your dates, after you run base date, and make some adjustments for holidays and the like. You may use the base date feature to adjust the dates further across your site, as needed. What if you get an alert? If there are any date discrepancies in your site's date ranges (i.e. dates in the past, outside a typical 4-6 month term period), Etudes will alert you to it. In the following example, the site includes dates in 2011 and 2012. If you get an alert, click on Cancel and fix the out-of-range dates, and return to set the base date. Current Base Date: What is it? The 'old' base date in a course site is the earliest date found in your site. Etudes searches through all your open, due, accept until, make visible on, and release dates, and finds the current 'base date'. It is an item in your site with the earliest date. For example, if your fall 2013 term started on August 26, 2013, and the earliest item that you opened or posted for students was a syllabus quiz on August 26, then, your base date will be 08/26/2013. However, if you chose to open your course early and you had opened a welcome forum on 08/22, then your base date will be 08/22/2013. New Base Date: What is it? Your job is to look at your calendar and find the new base date — the equivalent date for the next term. To continue with the previous example, if your old base date was Monday, 08/26/13, the new base date will be Monday, 01/27/14. Note the year, particularly when setting up winter or spring terms. There is no harm done if you enter an incorrect base date. You can always revert back to the previous set of dates by rerunning base date. Make a note of the original base date, in case you need to revert back.